We are now accepting applications from young musicians who wish to join our YOUTH, JUNIOR & LEARNERS brass band from September 2016 onwards. A special audition evening has been organised on 12 September - 6.30pm at Malone Presbyterian Church. Downshire has a long history of working with young musicians in Northern Ireland and was one of the first local bands to establish a programme for beginner and junior players in 1991. Roger Doherty, who pioneered this programme at Downshire, has continued to play a leading role and today oversees the burgeoning beginners and junior band. Over the years the Downshire Junior Band has played at the switching on of the Christmas tree lights at Hillsborough, at school garden fetes at Lisnasharragh, Stranmillis and Meadowbridge primary schools, played carols at Tescos, and performed at the senior citizens' Christmas concerts in Malone and Saintfield Road Presbyterian Churches. 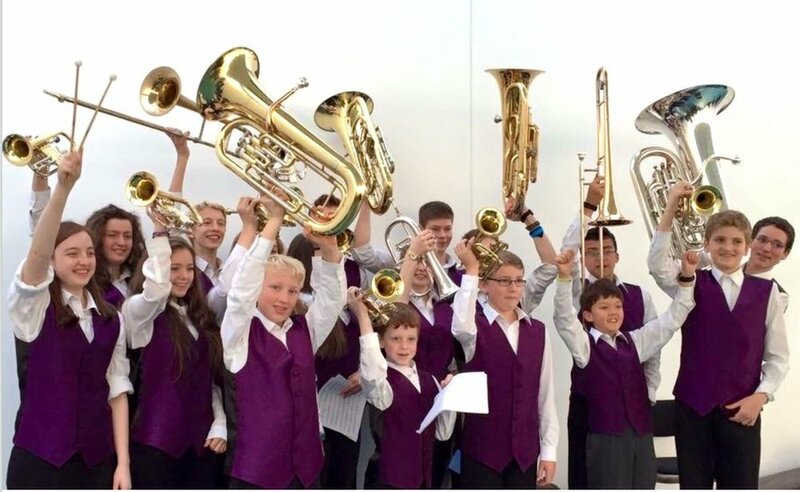 Following a successful Come and Play event in June 2013, a decision was taken to establish a Youth Initiative at Downshire involving the creation a new youth band alongside the junior band at Downshire. In a major expansion of activities, Brendan Coyle took on the role of developing a youth band, complementing Roger Doherty’s work in developing beginner players through the junior band. The new Youth Band finished in a very creditable third place in their first contest at the Festival of Brass at Queen’s University and in second place in the BBL solos and quartets competition. They have also taken part in performances in Victoria Square and St Thomas’ church in concert along with the senior band. An additional development for 2013-14 was the launch of the Newtownbreda High School Brass Academy. The innovative partnership with Newtownbreda brought all first year pupils into contact with instruments ranging from cornet to tuba and also percussion. Over the academic year, ten pupils were given individual tuition to get them started on various instruments before they were invited to take part in Downshire’s new Junior and Youth Bands. In response to a fund-raising concert at Newtownbreda and through investment by Downshire Brass, the band has been able to purchase a collection of musical instruments for the youth and junior bands. We are always keen to welcome new members to our junior and youth band programme. Instruments are available for new players. If you are interested in being involved then please get in touch via the following application form. If you wish to book the Youth or Junior Band, then please use the contact page on the band website.